There's a lot of room for more stories set in Westeros, and HBO might be taking advantage of that in the future. "Game of Thrones" spinoffs might be coming. HBO just reached a deal with four writers to explore possible spinoffs for the widely popular series. The show is based on the "A Song of Ice and Fire" novel series by George R. R. Martin, and Martin will be working with at least two of the writers HBO has hired. Given the huge world and deep mythos that Martin has developed, there's plenty of room for the writers to play around with. Martin himself has said there's "a whole world full of stories, waiting to be told ... if indeed HBO is interested." And Martin has already written a spinoff trilogy that HBO could draw from. "The Dunk and Egg" series of books are set almost 100 years before the action in "Game of Thrones" begins and have a lighter tone than the current series. Whatever the spinoffs end up being, HBO doesn't seem to have a set time frame for them. IGN reports the network is planning to let the writers work on the projects at their own pace, so it might be awhile before any spinoff sees the light of day. That's OK, though. 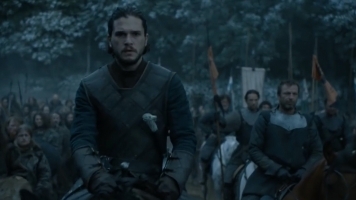 If there's one thing "Game of Thrones" fans know how to do it's wait.